Russian text, a neon colored flickering background, and haunting ambient music. Hotline Miami's title menu makes a strong first impression that can be mostly summed up in “WTF?” Even down to its nonsensical title, Hotline Miami is a strange game but, unlike its creator's past projects, it’s a focused, narratively driven game where all the obscure elements continually build a bizarre, twisted world and fun game. Stallions in America, Stench Mechanics, SeizureDome, Burn the Trash, God Came to the Cave, Keyboard Drumset Loving Werewolf. If a Cactus game doesn’t sound like the latest street drug, it at least sounds like a title made under the influence of one. A typical Catcus (Jonatan Soderstrom) game stretches the definition of “ludicrous” to its breaking point, is made in 7 hours, and has crude graphics that would make the Atari 2600 blush. Soderstrom may have a rabid sense of imagination, but Hotline Miami is his first attempt at trying to focus on a project for more than a day. The results are … interesting. Hotline Miami will draw a lot of comparisons to Retro City Rampage due to its Game Boy Color visuals, top-down perspective, and points-based combat, but it couldn’t be more different. Where RCR is a homage to videogames of the ‘80s and ‘90s, Miami pulls its influences from music and film, mainly David Lynch and twitchy, gloomy electronic music. The game has a strange aesthetic but it suits the story that begins with an owl and horse asking you to kill people. Sometimes the homeless. 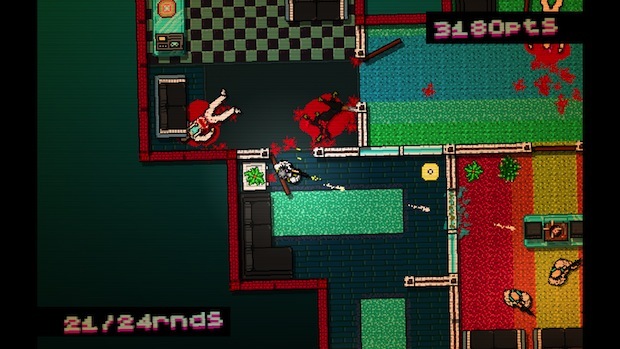 If Retro City Rampage is all about causing havoc in open spaces, Hotline Miami is all about controlled mayhem in small areas. You control your character with keyboard and mouse, but there is a lot of nuance to your approach. Enemies can kill in one shot, so you’ll need to keep quiet and be fast when dealing damage. For a retro asthetic, Miami sure is a brutal game. You’ll slit throats, filling the air with pixelated blood. You’ll beat guys to death on the ground with your bare fists. And none of these thugs have a problem returning the favor. As bizarre and fantastical as the story becomes, the missions remain grounded in reality. You’re always a couple steps away from dying, you can’t kill attack dogs without a weapon, and enemies will spray machineguns at the first sight of you. As a result, you’ll need to use some strategic planning before your approach a mission. By holding down Shift, you can get a view of the area before you approach. 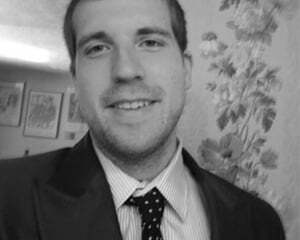 The game starts off simple enough, letting you get by on brute force and good timing. Soon, you’ll need to plan out assaults and perfect your approach. Throughout the game, you’ll acquire masks that act as buffs. Some will make you stronger, while others will make you faster. There is even a Fish Mask that turns all the dialogue to French in honor of French-Canadian Phil Fish. There is also an elaborate points system that judges your play on approach, timing, and other details most games don’t take into account. If you run into a room, you’ll score points for “boldness.” If you use a variety of weapons, you’ll score points for “flexibility.” Like everything else about the game, it’s a very strange thing. 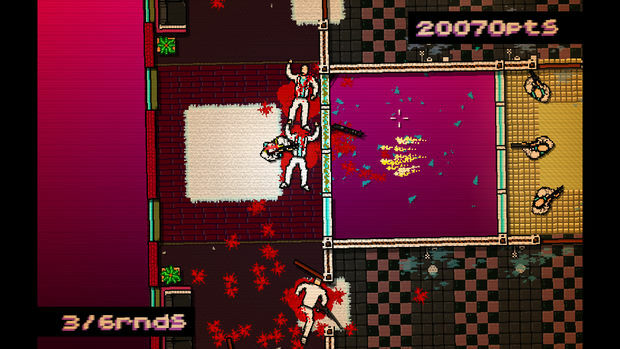 Like previous Catcus games, Hotline Miami has a strong aesthetic that resembles little else on the market. It’s trippy, haunted depiction of 1980s Miami that needs to be seen and heard to be fully appreciated. The brutal difficulty matches the violence, but like Super Meat Boy it is locked into such a quick start-and-restart cycle that you won’t be bothered much by it. Between its twisted narrative (which we can’t really go into here) and unique approach to top-down action, Hotline Miami is shaping up to be a surprisingly fun and accessible game from a developer who is known for making games that often rebel against those common developer goals. Whether this is an artistic compromise or a maturation is something we’ll find out when the game comes to downloadable services this fall.